Have we reached the tipping point in the grassroots effort of conveying the medical miracles of plant-based nutrition to the world? I spent two and a half days with Dr. T. Colin Campbell (here I am with him and his beautiful and inspiring wife, Karen), my Guru whom I lovingly and with conviction have named "The Father of Modern Nutrition". He is, indeed, a pioneer who is changing the landscape of health as we have known it for the past century and taking it in a one hundred and eighty degree turn back to Hippocrates original wisdom. 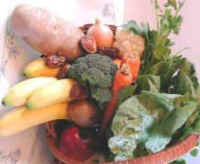 "Let thy food be thy medicine and thy medicine be thy food" was the dictum he proposed during his lifetime(460-377 B.C.). And yet we have strayed eons from this brilliant thesis in the past millennium. From food to pills and potions...from a holistic perspective to a specified point of reference, focusing on a specific vitamin or hormone responsible for a whole health issue. When will it be that physicians and researchers conclude that our body is infinitely wiser than we give it credit for? An article came out in the paper today regarding the most popular and utilized osteoporosis medication, Fosamax. It implicated the drug in causing fractures after long-term use even though its specific indication is for (potential) osteoporotic patients. Last week, the National Institutes of Health (the largest biomedical research organization) released a report of their concern for Americans' misunderstanding of lactose intolerance. They pretty much stated that we must do anything it takes to get the dairy into our bodies, ignoring any discomfort, illness or dis-ease it may cause in order to prevent osteoporosis. Ironically, studies clearly state that the countries around the world who consume the most dairy have the highest incidence of bone fractures! Further, we are more obese as a nation than ever before in history. This newest generation is hypothesized to be the first to live a shorter lifespan than its parents. Rates of type 2 diabetes, hypercholesterolemia, hypertension and heart disease are above and beyond the rates corresponding to historical potential. And the age of onset of these diseases is younger than ever before. The statistics are frightening. And yet, the supplement and pharmaceutical industries are thriving. Restaurants serve larger and more deadly portions of fat, sugar and salt at rates that will scare you back to dead. They have huge panels of scientific experts dedicated to figure out which perfect combinations of fat, sugar and salt will have you coming back for more as much as possible. We have to face it...money talks and we are walking to our graves painstakingly yet surely. On an optimistic note, however, The Veggie Grill is a restaurant that is only about three years old and has already served nearly one million plant-based meals. This picture is of me with Kevin Boylan, the co-owner of The Veggie Grill. He and his business partner, T.K. Pillan, read The China Study in one weekend and went 100% plant-based immediately following its completion. It was then that they knew what type of restaurant they needed to open. The trailer for a film that is not even in distribution yet, entitled Forks Over Knives, has had almost 21,000 views on You-Tube posted less than a month ago. Here I am with Dr. Campbell, his lovely wife, Karen and Brian Wendel, Executive Producer of Forks Over Knives, after we screened the film yesterday. This film is the documentary that has the potential to change the landscape of medicine as we now know it, thanks to the brilliant pioneering work of Dr. Campbell and his colleague, Dr. Caldwell Esselstyn, whom are highlighted in the film. Ultimately, if we take a step back and observe the changes that are inarguable and omnipresent, it is undeniable that we are reaching a significant fork in the road. Our health is at the nadir of potential. We have no choice but to choose differently. My Father always told me that the definition of "crazy" is someone who keeps beating their head against the wall and expecting a different result. As Dr. Campbell brilliantly pointed out yesterday...we have finally "reached the tipping point"...people are starting to notice and it is a very exciting time!